The solution is simple to enable (activate) in ProcessKO the function to restart (reset) Windows programs via keyboard shortcuts! Some Windows programs like to hang over again and again and this is often the case with software tests and experienced Microsoft users as well as administrators the case for this reason one can start with the help of Process KO processes / programs / APPs directly by shortcut or restart if necessary when they really hang up. please use always ... the latest version of Process KO! 1.) ... The termination and restarting of hanging programs by keyboard shortcut! 2.) ... What should be considered when scheduling per keyboard shortcut? See also: ► ... Minimize MS Windows programs in the tray area! 1.) The termination and restarting of hanging programs by keyboard shortcut! Use [Ctrl + Alt + F4] to quit the foreground window! (Image-1) Restart Windows programs via Keyboard shortcuts! 2.) What should be considered when scheduling per keyboard shortcut? Please make sure that the program really hangs and is really in the foreground, try the program first on the standard procedure to exit / terminate. Unlike Apple's Mac OS ( Command + Q ) is under Microsoft Windows the usual method with the keyboard shortcut Alt + F4 or quite simply on the close button in the upper right of the program window also on the Windows taskbar by right-clicking on the program icon and At Win 10 "close window" in older only "close". Tip: do not use the Alt-Gr + F4 key. 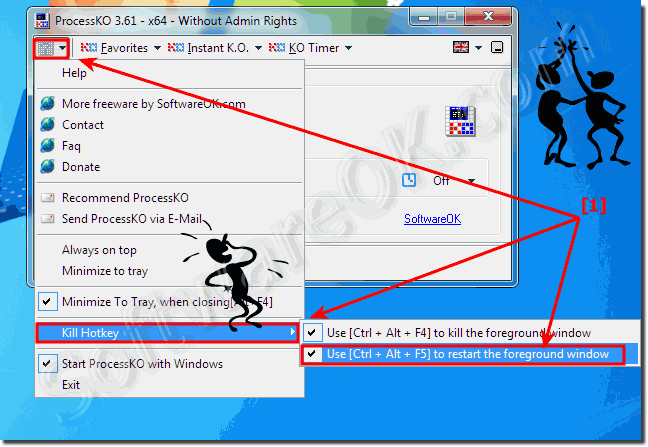 ProcessKO - FAQ-5: Keyboard shortcuts to re-start / close Windows programs?